Benavides Design House is a Medford, NJ based full service interior design firm founded by Kristen and Oscar Benavides, specializing in both new construction and renovation projects. Our firm is unique in our combined backgrounds of traditional and contemporary design and architectural experience from Colombia, Spain, Palm Beach and New York. We collaborate with and really listen to our clients every step of the way with a trademark attention to detail so the end result reflects our clients lifestyles and personalities. Whether you are interested in residential or commercial design, we are fully licensed to accommodate both. From space planning and material selections to Kitchen and Bath design, custom millwork, furnishings and window treatments, we take a creative and timeless approach to every detail. We can complete a set of construction drawings that the client can then hand to multiple contractors to receive apples to apples bids on their project. We help guide clients through the bidding process to make sure clients select a contractor that is a good fit for their needs and we continue to be their advocate every step of the way. We offer 3D renderings and animations so our clients can visualize how the finished space will look and feel confident in where they are investing their money. So if you are starting from the ground up, or looking to re-invent an existing space, we're excited to take that journey with you and help you capture your vision. We look forward to hearing from YOU! Benavides Design House is a Medford, NJ based full service interior design firm founded by Kristen and Oscar Benavides, specializing in both new construction and renovation projects. Tri County Development Group Inc.
A privately-held corporation established in 1991, Tri-County Development Group, Inc. is an award-winning custom builder, remodeler, and general contractor serving southern and central New Jersey along with the Jersey shore areas. Specializing in Custom Homes, Home Additions, Kitchens and Bathrooms, Tri-County Development Group Inc. was rated as one of the Best of Houzz 2013, 2014, 2015, 2016, 2017 . In the “Custom Builder” category at Houzz.com, Tri-County Development Group Inc. received over 100 “5-Star Reviews,” making it the most highly rated builder/remodeler in the tri-state area when rated by the only judges who really count—the clients! The principals, Kenneth R. Konopka Jr., Joseph R. Quinn and James B. Tarzy, were also proud to be recognized by the Best of Burlington County 2013, in the home-builder category. This is just the most recent evidence of Tri-County Development Group’s long-standing commitment to excellence and artistry for our client families, businesses, and our community. Greater Philly's Premier Interior Design Firm | 2X Best of Houzz! If hired, we promise a timeless room, efficient work ethic with a touch of fun, and for you to have a room that is everything you ever wanted and more! R. Craig Lord Construction Company, Inc. While recognized nationally for industry excellence, our proudest accomplishment remains the satisfaction of each homeowner. At KENT General Contracting Co., our goal is not only to help you design and build your dream addition, kitchen and or bathroom but to make the process easy and enjoyable for you. Working with homeowners, contractors, architects, and interior designers, we provide the time and personal attention required for a kitchen that not only looks like you want, but works efficiently. 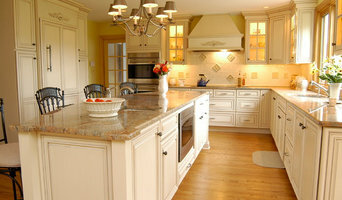 Award winning remodeling firm servicing the Southern NJ area for over 3 decades. Our expertise includes additions, kitchens, baths and home renovations. *Authorized Waypoint Living Spaces Dealer* Cherry's Designs is a proud member of the National Kitchen and Bath Association. (Membership requires following a strict code of ethics). Along with interior design, interior decorating, and color consulting, we also specialize in kitchen and bath cabinet design. But we offer far more than the average cabinet designs. For starters, Carol Cherry, owner, is a C.K.D., Certified Kitchen Designer. This means she has passed stringent testing by the National Kitchen and Bath Association and must attend ongoing seminars and educational programs to maintain her certification. This guarantees up-to-date product knowledge and design expertise. Carol has almost 40 years experience in related cabinet manufacturing, interior design, and kitchen and bath design. Burlington County's Experienced Interior Designers - 6X Best of Houzz! Our holistic design process balances livable and workable spaces with timeless design elements to create showcases that you will be proud to live in for years to come. Since I was 5 years old, dance was my passion. Performing in schools, dance organizations, musical productions, and with theatre groups consumed most of my early years. I entered and graduated Rutgers University as a dance major. I landed my first “professional” business world job as a creative writer with a PR firm, then as an editor of an award-winning Realtor newsletter. My first break from all that activity was because of marriage and children (two wonderful boys). The pattern for practicing interior design was eventually established through various jobs and contacts. I worked with pretty much every aspect of the business including builders, contractors, and architects. I also worked as a design center coordinator, representative for a large model home interior design firm, designer for furniture, fabric, and wallpaper stores, and as a principal of my own design company. I continued taking courses at the Philadelphia Art Institute and with other professional networks including marketplace seminars, ASID, and IIDA workshops. These experiences have continued to fine-tune my ever-growing design trade. In addition, I have also worked with some television productions. Working with shows, such as Trading Spaces and a series on the Oprah Winfrey Network, was certainly inspiring and glamorous. But the real thrill for me has been watching my clients’ businesses and the homes transformed into well-designed, comforting, visually-inspiring, highly-functional spaces they’ve been desiring. Nuss Construction is an award winning design build firm serving South Jersey for the past 50 years. John Colaianni has been working in residential construction for the last nine years, and joined Nuss Construction Company in 2014. John is passionate about providing a customer experience that you will never forget. He understands very well the needs of you the homeowner. John will explain your project from beginning to end, guide you through the selection process, and work diligently to deliver your project to a beautiful finish, on time and on budget. John is proud to wear the Nuss Construction logo on his chest and to continue the Nuss traditions of integrity, dedication, and service. As interior designers, we, at Storer Designs, strive to create the PERFECT LIVING ENVIRONMENT with the combination of creativity + functionality resulting in BEAUTIFUL SPACES for our clients that fit their lives. Every project reflects the quality of our work. QUALITY measured not only by aesthetics but also by the way our designs respond to our client's needs whether WORK, PLAY or simply a FRESH, NEW LOOK for an old space.